Like his friend Indy (pictured above), Wizard is shedding his winter coat. 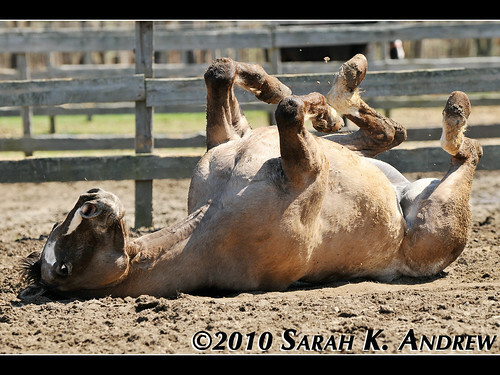 Rolling is helpful, as is grooming. I end up with a mountain of hair every time I groom him. For such a sensitive, sleek, fine-coated Thoroughbred, Wizard sure is a hairy fellow. After work (Yes, I worked on Easter. When there is racing, there is work), I drove to the barn for an evening ride. Before my ride, I did the usual quick free-longeing session with Wizard for about 5 minutes. I set up a “course” of trot poles, two down each straight line about 15 trot steps apart, one perpendicular, and one a stride apart from one of the four in the “course”. We worked on carrot stretches, followed by tacking up in the indoor arena. I mounted up and we warmed up at the walk for about 10 minutes. He repeated his ear-pinning behavior and I think I might be extinguishing it by ignoring it. I worry that it was a result of discomfort, but the fact that it goes away is encouraging. For most of the ride, his ears are forward or trained on me, but they do go back sometimes with leg aids. At the trot, we worked on a variety of exercises. I started by asking for rhythm and contact. Once rhythm and contact was reasonably established, we did a little bending work, first on large circles, then serpentines and finally, a variation on the “string of pearls”, softly bending left, then right, then left, down the center line. When I was getting a reasonable bend both left and right, we straightened out and tested our contact by trotting the poles in both directions. I gave him a pat and we took a quick break at the walk and I re-introduced leg yielding. Once again, Wizard flattened his ears when I applied very gentle inside leg pressure. Instead of reacting, I asked again and he responded correctly with a few steps of green but eager leg yield. I asked twice in each direction and then brought him back to a trot. We worked on transitions from walk to trot and back to walk. Wizard needs a lot of work on upward transitions, both for balance and for strength. Our transitions were very simple, trotting one long side of the arena, walking the short side, trotting the long side, etc. It takes him a while to establish rhythm at the trot, and he usually rushes and then slows down and then settles into my hands, so I am taking it slowly with him. I then kept the trot and asked him to increase his tempo a few times, encouraging him to move freely and forwardly. He complied, excitedly purring a little through his nose. This horse wears his heart on his sleeve. When he is tense, he makes the “gork, gork, gork” gelding sound and when he is excited, he purrs. I trotted him through the course of four poles one more time in each direction, followed by stretchy circle work, followed by a walking cooldown. Wow, a real workout! Our ride lasted about 35 minutes. Wizard was just a little damp under the saddle pad, girth, flanks, and behind his ears, but he cooled out quickly. We are both getting into better shape. And when I dismounted, I saw that he had a thin layer of foamy “lipstick” on his lips from the bit. When he’s tense, he drools, but then he’s relaxed, he softly works the bit and I could tell that tonight’s ride was very productive. What a great night! did he pin his ears each time? If not, then I would think you would be correct and it is more likely anxiety than pain. No, he only pinned his ears the first two times. I’m usually one to chalk everything up to pain, but so far this reaction does seem behavioral.